Hi Everyone! 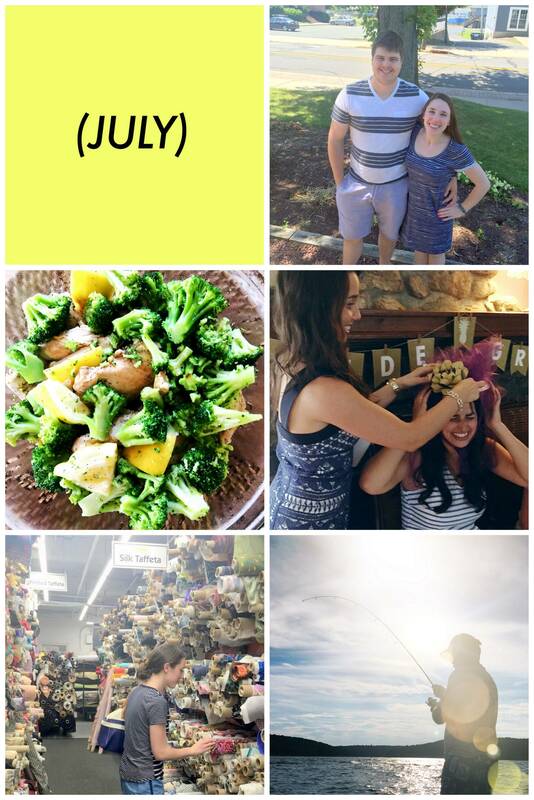 I realized I forgot to post my July mini scrapbook challenge summary, so I’ll include it with the August update. In case this is your first time seeing my Scrapbook Sunday post, click here for the inspiration for this monthly challenge. Anyway, back to my monthly photos! 4th of July: We participated in the usual 4th of July activities: local parade, lunch at the cafe, lots of ice cream, swimming, fireworks in town, etc. We started Whole30 the next day, so we were fitting in all the sugar and gluten that we could find. Trip to Mood: Here’s a photo of me in my natural habitat… feeling all the pretty fabrics and dreaming up new projects!! To see everything I bought on that trip, read this post! Fishing on our lake! We were able to get a boat slip out on the lake near our house, and we love floating around every night. There’s a few restaurants and even a lake front ice cream shop! Tie Dye Quilt: Probably my new favorite quilt! I hand-dyed all the blue strips, and went with my favorite simple log cabin style. Click here for more details! 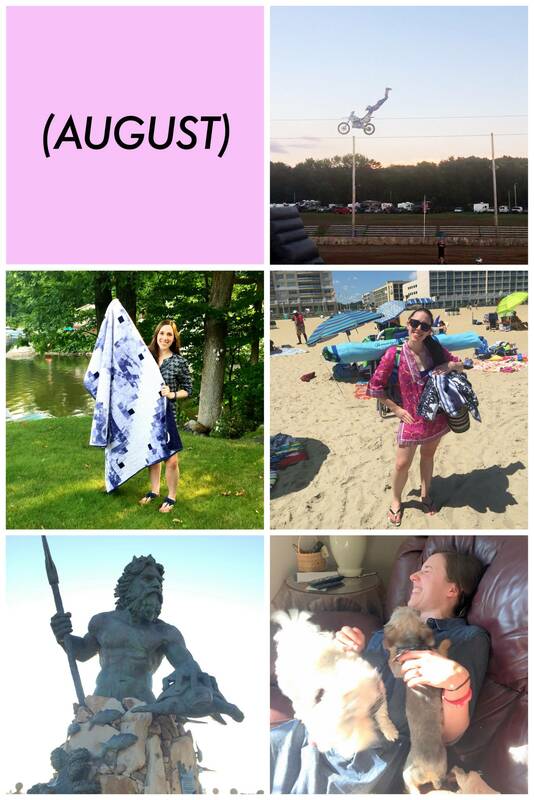 VA Beach: I kind of felt like a pack animal carrying the beach chair, umbrella, beach bags, and towels… Then we only stayed on the beach for a few hours because it was SO HOT. And I got a little sunburned (despite reapplying SPF 50 multiple times). VA Beach: Neptune! Part of the reason I chose VA Beach for our weekend trip was because I had a 9-mile run that weekend! I knew the beach had a 3 mile boardwalk, and I wouldn’t get too lost running a straight line! Below is the Airbnb listing for the great place we stayed! Trip to PA: We went out to PA for Shannon’s other bridal shower. While we there, I was attacked by tiny adorable puppies!! And that’s it for July & August! Can’t wait to see what’s coming up in September! And don’t forget to preorder for the December Daily challenge! This kit is amazing, and I CAN’T WAIT FOR CHRISTMAS.